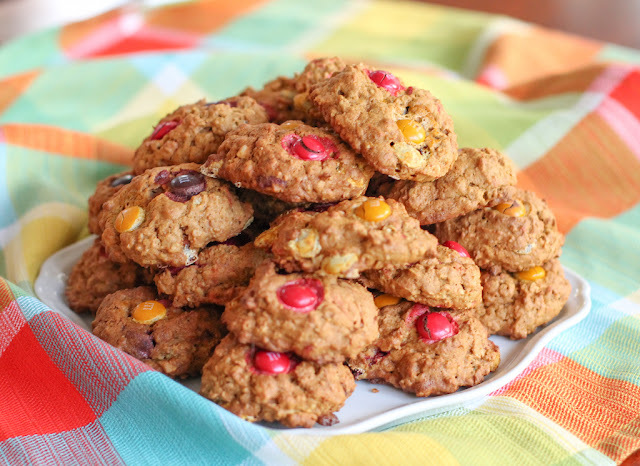 Peanut butter and pumpkin combine beautifully for cake-y cookies chock full of chocolate chips or M&Ms. Great for parties and snacks this time of year! I may have mentioned once or a thousand times before but I am not much of a sweet eater. Give me a large link of smoked sausage over a sweet slice of chocolate cake any day. 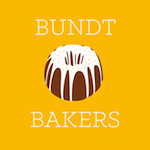 New friends, that is ones I've made in the last four years since I started blogging, are always shocked by this revelation because I bake so much. I love to bake, it’s true! I just give it all away, mostly. When you consider the expensive hobbies some people enjoy, like collecting antiques, horseback riding or racing yachts – even quilting, have you priced quality fabric lately?! - this is relatively cheap. 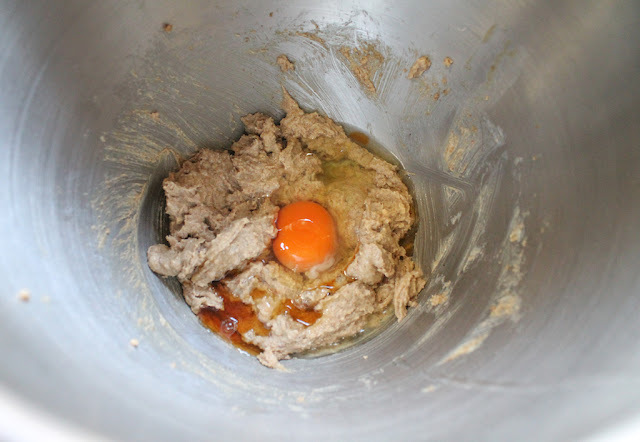 Some eggs, butter, flour, flavorings. I love the creative process of baking, plus there’s the added bonus of feeling benevolent when I give treats away. If you are looking for a hobby, this is a good one! I’ve got another confession to make about these cookies in particular. I’ve discovered that I am not a fan of the seasonal M&Ms. I thought they would taste the same as other M&Ms but they really don’t. I think they are sweeter. (See paragraph 1.) The colors are great but next time I make these cookies, I’m going to stick to semi-sweet or dark chocolate chips, the only chocolate I actually like. If you like the seasonal ones, by all means, carry on. The cookies themselves were fluffy and cake-y and soft. And not overly sweet when I ate around the M&Ms. Yes, I did that thing. 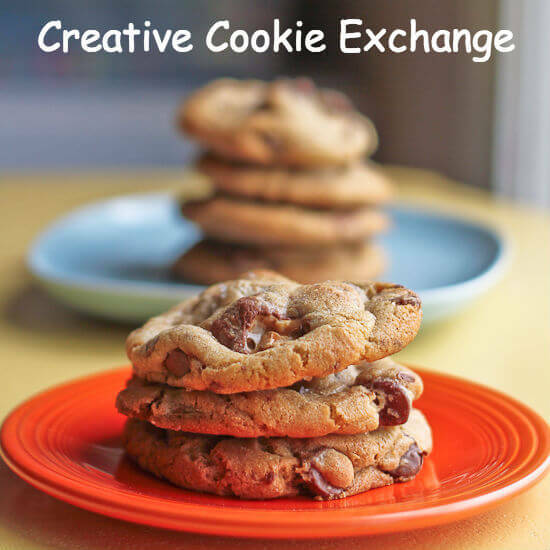 Many thanks to Laura from The Spiced Life for organizing our Creative Cookie Exchange group and choosing this month’s theme: Celebrate the Pumpkin. Thanks also to Renee from Magnolia Days for putting together our link list of 12 pumpkin related cookies. 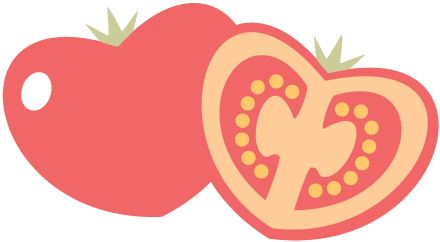 Make sure you scroll down to check them out at the bottom of my post. This recipe was adapted from one on the Bob’s Red Mill site. Preheat your oven to 350°F or 180°C and prepare your baking sheet by lining it with parchment or a silicone baking mat. 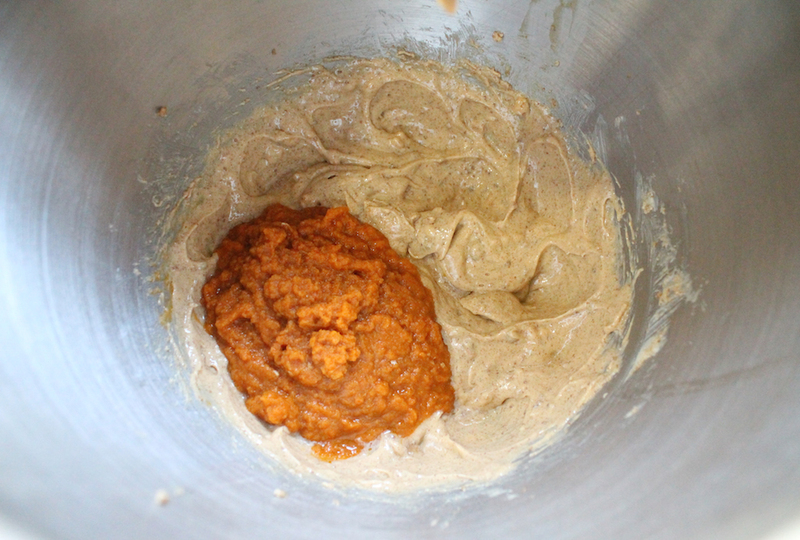 In a large mixing bowl or the bowl of your stand mixer, cream the peanut butter, butter and sugars together until fluffy. Scrape down the bowl with a rubber spatula. Add in your egg and vanilla and beat again. Add in the pumpkin and beat again until combined. 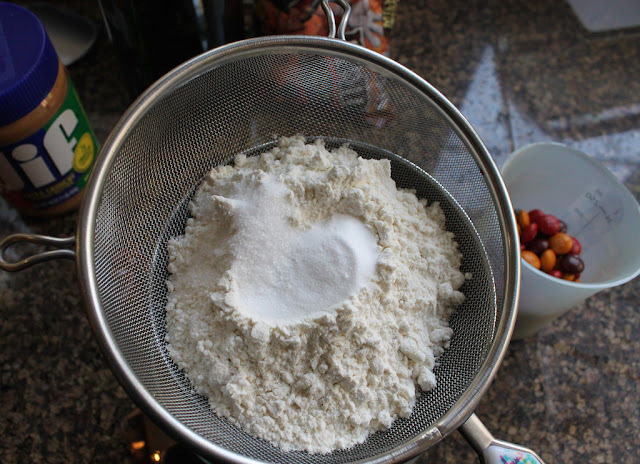 Sift the flour, soda and salt directly into the same bowl. Beat again. 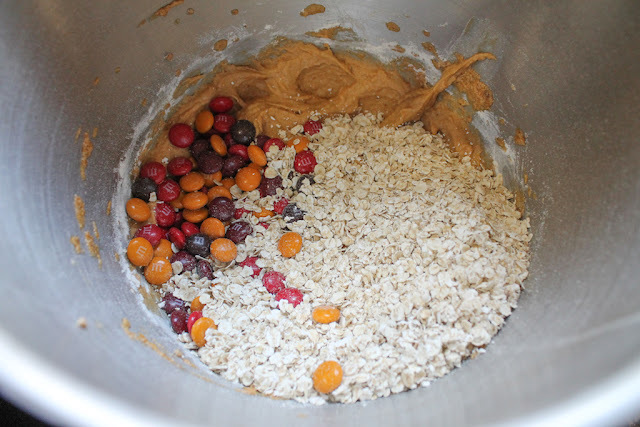 Finally, add the oats and M&Ms and stir well or use your beaters on a very slow speed to combine. You don’t want to break up the M&Ms. 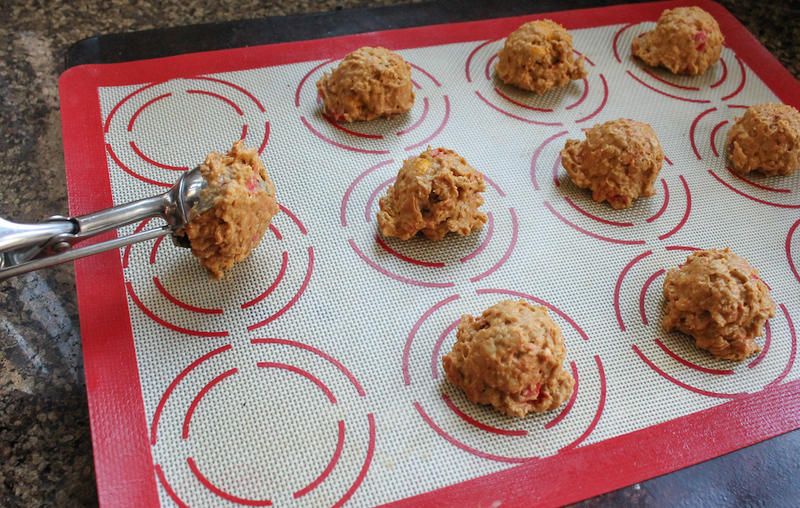 Use a scoop or a spoon to drop balls of cookie dough onto your prepared cookie sheet. Poke a few more M&Ms on the top of each for decoration, if desired. 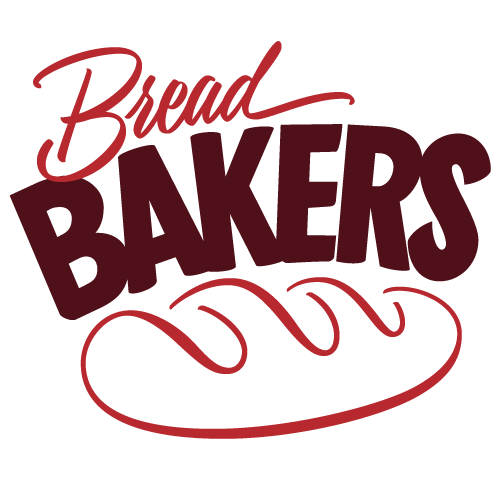 Bake in your preheated oven for 12-14 minutes or until just browned. 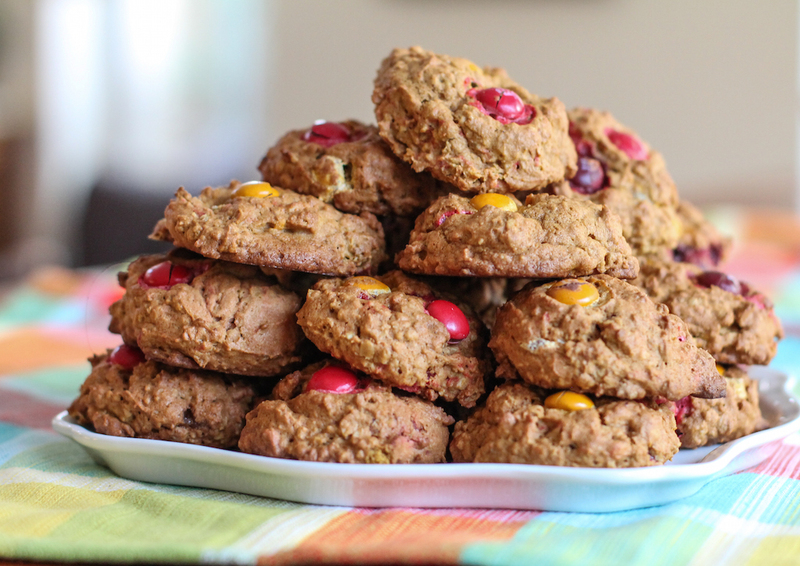 These cookies should be chewy and slightly under- rather than over-baked, if you are going to err on one side or the other. They turn out soft and cake-y and no one likes dry cake. 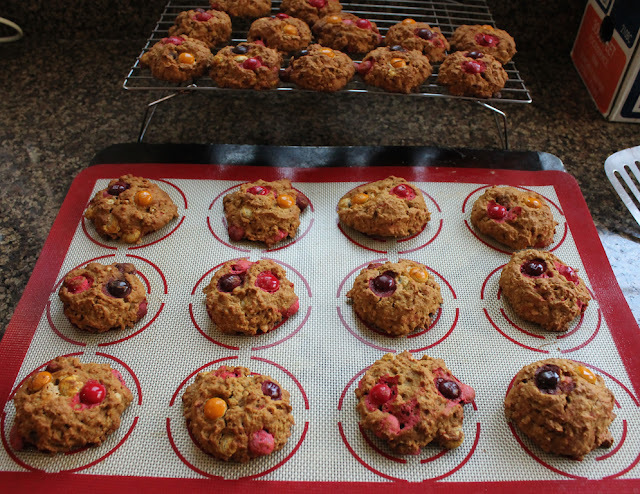 Allow to cool for a few minutes on the pan then remove the cookies and leave to cool completely on a wire rack. 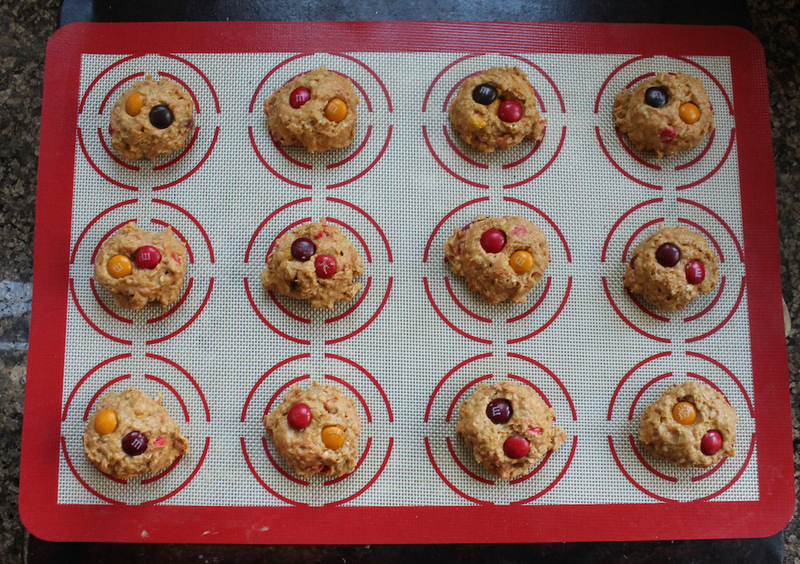 Repeat the scooping/baking process until all the cookies are done. This makes about 2 dozen, depending on the size of your scoop. Mine is 2 tablespoons or 30ml and I got 27 cookies. 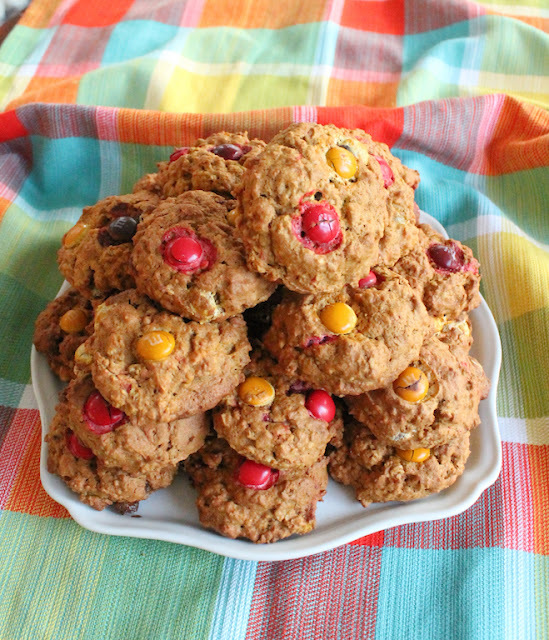 Need a great resource for cookie recipes? 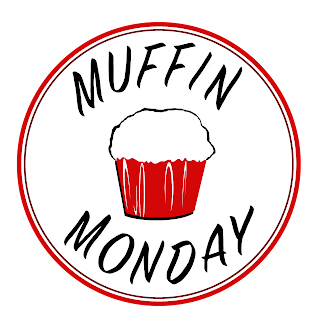 Be sure to check out our Pinterest Board and our monthly posts (you can find all of them at The Spiced Life), on the first Tuesday after the 15th of each month!